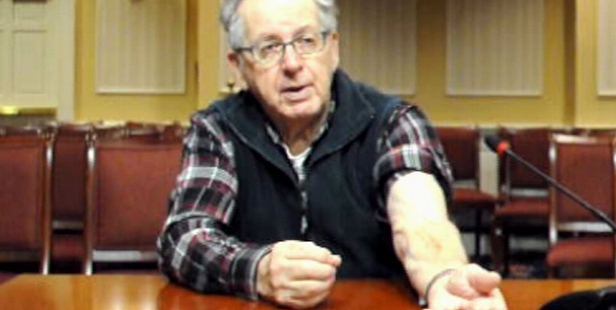 John Streb shows the arm in which he contracted vibriosis. With a flesh-eating bacteria often going unnoticed in the Chesapeake Bay, legislators are rallying behind a bill that would warn potential victims. The naturally-occurring bacteria, which causes infections called Vibriosis, is most commonly contracted through open wounds or cuts. In 2013, there were 57 reported cases, jumping from 25 cases in 2001. SB 83 was heard by the House Environment and Transportation Committee Wednesday after passing the Senate unanimously last month. The bill requires the Department of Natural Resources to send warning pamphlets along with any purchases of new or renewed recreational tidal fishing licenses, recreational crabbing licenses, and certificates of boat number. Sen. Bryan Simonaire, R-Anne Arundel, the sponsore, hopes to target the most likely contractors of the bacteria; those who bait hooks and handle sharp-edged shellfish. John Streb contacted Simonaire about the bacteria after having contracted it in 2010. Fishing just ten miles up from the Bay Bridge, in a hole near Belvidere Shoals, Streb was holding his freshly-caught fish in his right hand as he pulled the hook out of their lip with his left hand. The next day, he noticed what seemed to be a blood blister on his right-thumb. Thinking nothing of it, he patched it and went on with his day. Soon he was experiencing pains and stomach sickness, indicators of Vibriosis. He sought medical treatment before the loss of his arm; luckily Vibriosis is treatable with antibiotics. “It is a pretty serious issue…especially in the Northern Bay,” said Del. Jay Jacobs, R-Queen Anne’s, remarking on how some of his friends have seen cases of it. The bacteria is most common in the Chesapeake Bay and tributaries during the warmer months, which is why Simonaire hopes to get word out to fishermen before summer fishing seasons. “Vibriosis is actually a case that can be very deadly,” said Del. Clarence Lam, a doctor who remembers studying the bacteria in medical school. “Not all species can infect humans, but two strains that can have raised concern in the Bay watershed: Vibrio vulnificus and Vibrio parahaemolyticus,” according to the Chesapeake Bay Foundation, which are in support of the bill. Vibrio vulnificus is the most common in the Bay, causing severe skin ulcers, gangrene and deadly blood infections. There are 80 species of Vibrio in all. Del. Anthony O’Donnell, R-Calvert and St. Mary’s, remarked that Vibrio also affects shellfish and aquaculture farmers, who actually test the water for the bacteria. O’Donnell suggested that the Department of Health and Mental Hygiene (DHMH) and the Maryland Department of Environment, who are in support of the bill, use the same tests as the National Shellfish Sanitation Program in locating bacteria in waterways. The committee delegates and Simonaire seemed in favor of this idea. DHMH suggests swimmers and fishermen cover open sores with waterproof bandages before activity. If sores are contracted during activity in the Bay, cuts should be washed with soap and water immediately. View a fact sheet on Vibriosis here.